Mock dessert pie recipes seem unusual, yet they come in handy for those times when you don't have the called-for ingredient at hand. They were most popular during the Great Depression in the 1930s when fruit and cream were sometimes scarce. Mock apple, lemon, and minced pies tended to be the most popular though cherry pies made using cranberries were made in some regions. 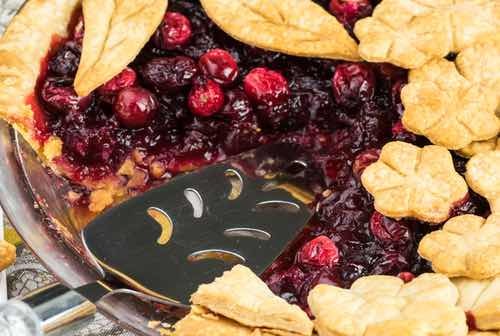 These pies are fun to make and serve, so be sure to try them! Crush finely with a rolling pin, one-half dozen large soda crackers; put it into a bowl and pour upon it one teacupful of cold water; add one teacupful of fine white sugar, the juice and pulp of one lemon, half a lemon rind grated and a little nutmeg; line the pie-plate with half puff paste, pour in the mixture, cover with the remaining puff paste and bake half an hour. These are proportions for one pie. Take three eggs, one pint of milk, a cupful of sugar, two tablespoonfuls of cornstarch or three of flour; beat the sugar, cornstarch and yolks of the eggs together; after the milk has come to a boil, stir in the mixture and add a pinch of salt and about a teaspoonful of butter. Make crust the same as any pie; bake, then fill with the custard, grate over a little nutmeg and bake again. Take the whites of the eggs and beat to a stiff froth with two tablespoonfuls of sugar, spread over the top and brown in a quick oven. Mix one cup cranberries cut in halves, one-half cup raisins seeded and cut in pieces, three-fourths cup sugar, and one tablespoon flour. Dot over with one teaspoon butter. Bake between crusts. 4 common crackers, rolled, 1-1/2 cups sugar, 1 cup molasses , 1/3 cup lemon juice or vinegar, spices, 1 cup raisins, seeded and chopped, 1/2 cup butter, 2 eggs well beaten. Mix ingredients in order given, adding spices to taste. Bake between crusts. This quantity will make two pies. 1 cup cranberries cut in halves, 1 cup sugar, 1 teaspoon vanilla, 1 tablespoon flour dissolved in 1/2 cup water, 1 egg. Mix well together and bake between 2 crusts. 3 eggs, 1 cup sugar, 1-1/2 pints buttermilk, 1 teaspoon extract of lemon, 1-1/2 tablespoons flour. 4 eggs, 4 cups water, 1 cup sugar, 1 cup molasses, 1 cup flour, 1 cup vinegar, 1 cup raisins, 1 teaspoon cloves, 1 teaspoon cinnamon, 1 teaspoon soda, 1/2 dozen crackers (crushed very fine). Line a plate with a rich puff paste, and fill with the following: beat up two eggs with one cup and a quarter of sugar, one cupful of bread which has been soaked in warm water, one-half cup of molasses, half a cup of vinegar, half a cup of water, one cup of raisins, a pinch of salt, half a teaspoonful of ground cloves, one teaspoonful of cinnamon, and pinch of pepper. This quantity will make two pies. Cover with strips of crust and bake half an hour until done. Bread crumbs, sugar, molasses, vinegar, boiling water, raisins, and currants, each 1 cup; butter, 1/2 cup; spices to taste. Cracker crumbs, sugar, molasses, boiling water, and raisins, each 1 cup; vinegar and butter, each 1/2 cup; 2 beaten eggs; nutmeg and cinnamon, each 1 teaspoonful; cloves, 1/2 teaspoonful. Either of them will make 3 pies. Crackers, double handful; tart apples, medium size, 8; raisins, 1 cup; butter and molasses, each 1/2 cup; ground cinnamon, cloves, and allspice, each 1 teaspoonful; salt, 1 saltspoonful; sugar and apple cider. Directions: Roll the crackers; pare, core and chop the apples, melt the butter, and mix all, using cider to make sufficiently moist, and if the cider is not quite tart, add 1 or 2 tablespoonfuls of vinegar, with sugar enough to give the requisite sweetness, which each must judge for himself, as tastes vary so much. Remarks. —The apples give these pies a much greater resemblance to the real, than as formerly made without apples. If they are made with a light biscuit crust, which is made with at least 1 teaspoonful of baking powder, then wetting the bottom crust with the beaten white of an egg before the mixture is put in, even the dyspeptic may eat them, if he can eat ordinary food. They are healthful, as well as very tasty. Give the author the one with the apples when he calls upon you.